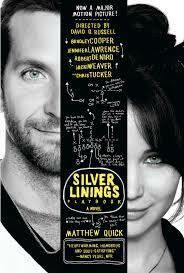 So I saw the movie Silver Linings Playbook (SLP) about half a year ago, and I still think about it from time to time. This film is a strong advocacy piece for the mental health community and has served as a real conversation starter on a topic that is often taboo and stigmatized. In an interview with the director/screenwriter of SLP, David Russell, along with Bradley Cooper and Robert DeNiro, it was evident that SLP was a labor of love for all of them. David Russell’s son is bipolar, and plays a minor character/comic foil in the movie. Robert DeNiro, whose father also suffered from mental illness, tears up during the interview — this guy with the gruff exterior has a super soft side! Russell and Cooper visited Washington D.C. on the invitation of Vice President Joe Biden and Senator Debbie Stabenow, to lobby Congress for legislation to shore up the U.S. mental healthcare system as part of an effort to reduce gun violence. I had really wanted SLP to win Best Picture but it lost to Argo — I haven’t seen Argo and I’m sure it’s great, but was it a labor of love like SLP? What I really love about SLP is that, even though the two main characters Pat and Tiffany (played by Georgetown alumnus Bradley Cooper and Jennifer Lawrence) are supposed to be the ones who most obviously suffer from mental health issues, SLP is great at depicting how everyone, even “normal” high-functioning people, was a bit whacked out and how their own realities don’t quite line up with Reality. I think this is an overall reflection of how we all have our own blind spots to logic and level-headed rationale; it’s just that some might have more blind spots than others, or are less adept at hiding them. Pat’s father, Pat Sr. (Robert DeNiro), is addicted to gambling, and is a huge fan of (and likes to bet on) the Philadelphia Eagles football team. He superstitiously points his TV remote controls in a certain direction, believing that this will help the Eagles win games. He sends Pat to see a game (thinking that his son is good “juju” for the Eagles to win), and it’s a disaster: Pat ends up getting into a brawl to defend his brother, the Eagles lose, and Pat Sr. loses his fortune on a bet. Pat Sr. lashes out at Pat, saying that Pat has been spending too much time with Tiffany practicing for a dance competition. Tiffany appears and plays along by Pat Sr’s rules of “logic” about good/bad juju – she starts listing out all the Eagles’ games where they won — and notes that Pat has been practicing with Tiffany all of those times. Then, as the clincher, she observes that Pat’s new motto, “Excelsior,” is the motto for New York State, and the New York GIants were the ones who defeated the Eagles in this last game. Pat’s brother, who is a lawyer, says to Pat Sr., “Dad, she makes sense,” and in the crazy world of football and the Eagles, she does make sense. And she wins Dad over by entering into his crazy version of reality. So that’s one example of where sense and real life diverge. In this case, it is amusing and endearing. In other cases, it is messy and destructive. This describes the human condition, and. SLP holds it all in tension. In one particularly moving scene, Pat Sr. wakes Pat, and he starts crying (Robert DeNiro actually added the tears — they weren’t scripted), and sharing with his son about how sorry he is for not spending more time with Pat when he was young — Pat Sr. admits that he just didn’t know how to handle his son’s wild mood swings (at the time, undiagnosed bipolar), so he avoided Pat. Tiffany and Pat fall in love (major spoiler), and it’s not because both of them have somehow become whole and healed of their mental illnesses, but this love occurs in the midst of their gritty reality, which makes their relationship so redemptive and authentic. It’s not a happily-ever-after saccharine ending to a fairy tale where both characters are transformed from toads, pumpkins, beasts, marshmallows, or whatever, into a handsome prince and beautiful princess (even though they are undoubtedly both very attractive people), but it’s satisfying because they are both the same in essence as they were before and yet there is healing and transformation through their joy and companionship, bonded through common pain and suffering. I loved reading this – Silver Linings Playbook is such a good movie. My book club watched it together instead of reading a book…such a good movie for discussion.